MySQL 4.1 extended password hashes from 16 to 41 bytes. However, upgrading MySQL does not automatically update the old password passwords, so existing passwords continue to be stored in the deprecated format. This is because MySQL does not store passwords as plain text, so regenerating password hashes requires user intervention. The associated secure_auth option was enabled by default as of MySQL 5.6. It is always enabled as of MySQL 5.7, meaning it can not be disabled. A future MySQL release will remove this option. With this option enabled, a user with a password defined in the old format will not be able to login to MySQL. With all that said, the deprecated password format does not function with MySQL 5.7. All passwords using the old format must be updated. This section documents how to upgrade these passwords using MySQL Workbench. For information about migrating away from the old password format using the MySQL command line instead of Workbench, see Migrating Away from Pre-4.1 Password Hashing and the mysql_old_password Plugin. 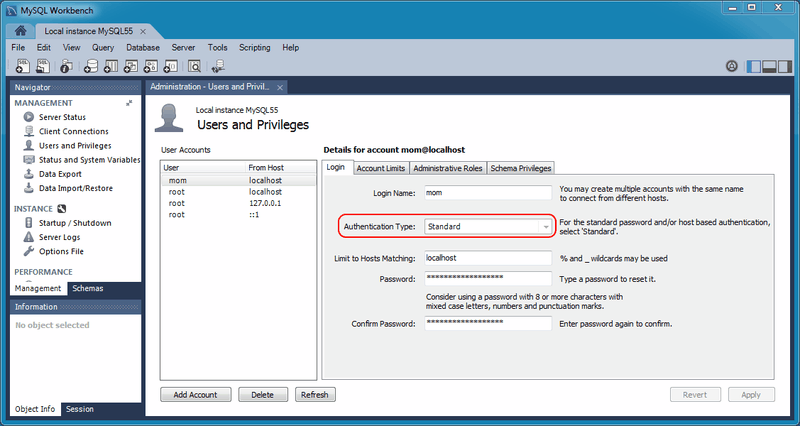 The method that MySQL stores a password is defined by an authentication plugin. The old method uses the mysql_old_password authentication plugin, and the current default method uses mysql_native_password. As of MySQL 5.6, a sha256_password option is also available although it requires an SSL or encrypted connection. When Workbench upgrades passwords, it upgrades mysql_old_password to mysql_native_password. For additional information about authentication plugins, see Pluggable Authentication. 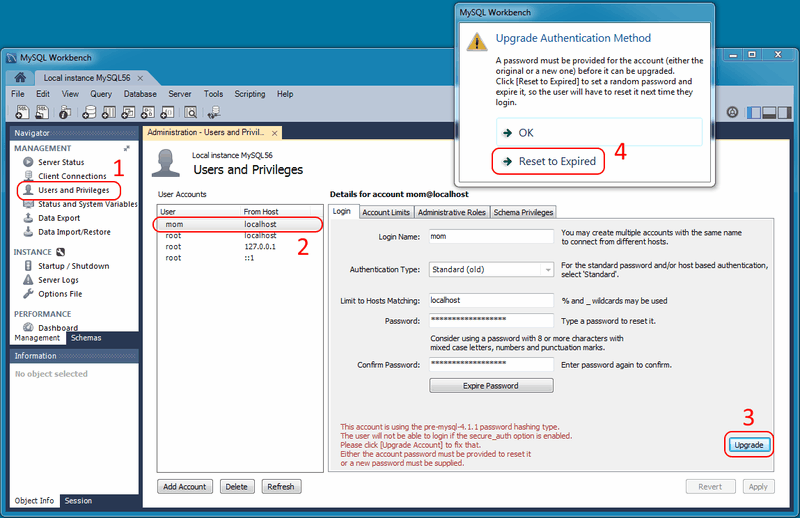 If the secure_auth MySQL Server option is disabled, then you can log in using the user with the old password format and update the user's own MySQL password. However, this is not an option as of MySQL Workbench 6.3.5 because compatibility with the old password format was removed. For this reason, a user's ability to upgrade their own password format must be done using the MySQL command line as described in Migrating Away from Pre-4.1 Password Hashing and the mysql_old_password Plugin. If using the MySQL command line is not an option, then you could use an older version of MySQL Workbench (version 6.3.4 and earlier), which allows you to enable a Use the old authentication protocol option under the Advanced connections tab. Older versions of Workbench are available at https://downloads.mysql.com/archives/workbench/. As stated earlier, secure_auth is enabled by default as of MySQL 5.6, and always enabled as of MySQL 5.7. If secure_auth is enabled, you can not log in if your user's password is stored in the old format. Attempts will fail and emit an error similar to "ERROR 2049 (HY000): Connection using old (pre-4.1.1) authentication protocol refused (client option 'secure_auth' enabled)". To upgrade the password, you can either disable secure_auth (not recommended) then update as described above, or log in as a different and privileged user, such as root, to change the password for a different user. 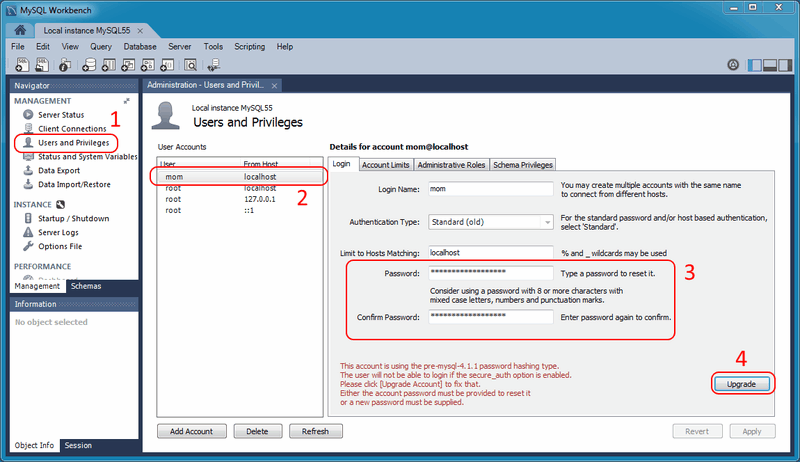 Keeping the above in mind, there are two methods to update passwords using Workbench. Manually enter a new password, or the current password, and click Upgrade. This upgrades the password to the newer password format, and the MySQL user can now log in using the new password that you defined. Rather than editing the password field, leave it alone and immediately click Upgrade. From here, you can generate a random password and tag it as expired by clicking Reset To Expired. Use this temporary random password to login the user, and MySQL will prompt for a new password when the user first logs in. When resetting to a random password, you must save the password and give it to the user. You will find the random password in the new popup window that is similar to the following figure. After completing the upgrade, notice the new Authentication Type for the connection. In the example shown in the next figure, the value changed from Standard (old) to Standard. In other words, the authentication type changed from mysql_old_password to mysql_native_password.